As much as I love football, the one argument that is kind of hard to defend my beloved game against is that there are too many commercials. As a football fan you train yourself to almost block them out, or even accept them in your life, but all it takes is one really crappy commercial, or an oddly timed commercial break, or worse the observation of a casual observer to realize that you actually spend most of your time watching a football game, watching commercials. It’s a problem that most severely affects football games, but it serves as the burden of all television as well. Unfortunately with channel flipping being such a dangerous proposition, and devices like the hopper only letting you skip commercials on recorded programs, it’s also one that has become an inescapable reality of watching live TV. 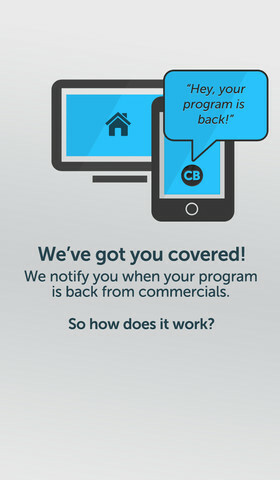 The makers of Commercial Break don’t see it that way though, and through their app actually allow you to use your iPhone, iPod Touch, or iPad (with Android compatibility coming soon) as a heads up to when your favorite channel is done with commercials. While the exact answer to how this works on a technical level is a complicated conundrum that has something to do with analysis and algorithms, how it works on a user end actually couldn’t be simpler. Just choose the channel you are currently watching from the apps list, and hit start. From there, you receive a notice whenever your program is back on, meaning you are free to go walkabout, switch channels, or even turn off the TV without missing your program, or having to suffer another poorly scripted shill. It’s a great idea that is made even better by the fact it actually does work extremely well. However, even though the functionality is what you’d want it to be, there are some limitations to consider before downloading. For instance, so far the only channels supported are ABC, CBS, NBC, CNN, ESPN, ESPN2, USA, TBS, and TNT, and even then you only get all of those channels if you live in NYC, with coverage varying beyond there, and being completely nonexistent outside of the US. That may sound like a pretty big catch, but the developers are aware of the need to expand both coverage and available channels, and are looking to do so should the apps early build prove successful. For now though what you are downloading is an investment in the future. One free from corporate brainwashing and terrible jokes spawned by deadlines and budgets constraints, and one instead full of trips to get more beer or use the bathroom that are free from the fear of missing your show, or having to wait for the recording. No longer will you sit down on Sundays to watch commercials with football in between, but rather will be able to sit down and just watch football. If you read that last paragraph and saw an American flag waving behind you, then you can probably see the potential of Commercial Break, and why it is my app of the week.